31° Cool change. Late showers. GOAL BulldogsMitch Honeychurch scores a goal from a Stoppage. GOAL BulldogsTory Dickson scores a goal from a Stoppage. BEHIND TigersLiam McBean scores a behind from a Turnover. GOAL BulldogsJack Macrae scores a goal from a Turnover. GOAL BulldogsMarcus Bontempelli scores a goal from a Turnover. BEHIND BulldogsJake Stringer scores a behind from a Stoppage. GOAL BulldogsJake Stringer scores a goal from a Turnover. Richmond has now kicked three goals from kickins and six goals from chains originating in their defensive 50. GOAL TigersNathan Gordon scores a goal from a Kickin. BEHIND BulldogsMarcus Bontempelli scores a behind from a Stoppage. The Dogs kicking efficiency is 90 per cent in their defensive half, 62 per cent in their forward half and 44 per cent in their forward 50. BEHIND BulldogsJason Johannisen scores a behind from a Turnover. The Dogs have turned the ball over in their defensive half only four times. Richmond has turned the ball over in their defensive half 18 times. Both teams have scored one goal from these turnovers. GOAL TigersShaun Grigg scores a goal from a Turnover. RUSHED BEHIND to Bulldogs from a Turnover. BEHIND BulldogsMatthew Boyd scores a behind from a Turnover. BEHIND BulldogsMitch Honeychurch scores a behind from a Stoppage. Richmond kicked 1.2.2 (23) in the third quarter from nine inside 50s. 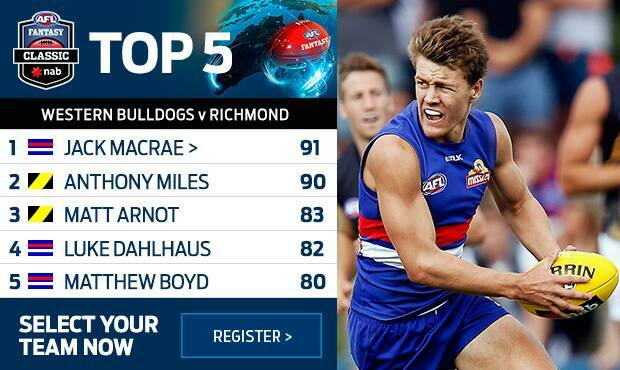 The Dogs kicked 0.3 (3) from 14 inside 50s. GOAL TigersMatt Arnot scores a goal from a Stoppage. BEHIND TigersReece McKenzie scores a behind from a Stoppage. GOAL TigersChris Knights scores a goal from a Kickin. BEHIND BulldogsLuke Dahlhaus scores a behind from a Kickin. BEHIND TigersSteven Morris scores a behind from a Turnover. Four of Richmond's six goals have been launched from their defensive 50. Three from turnovers and one from a kickin. SUPERGOAL TigersSam Lloyd scores a supergoal from a Kickin. BEHIND BulldogsLachie Hunter scores a behind from a Turnover. Michael Talia has won six intercept possessions, including four intercept marks. Three of Talia's six intercept possessions have launched Western Bulldogs' scores. Nick Vlastuin also has six intercept possessions for Richmond. GOAL BulldogsMitch Wallis scores a goal from a Turnover. BEHIND BulldogsMichael Talia scores a behind from a Turnover. GOAL BulldogsJack Redpath scores a goal from a Turnover. The Dogs lead inside 50s 28 to 12 but have registered only four more scoring shots. GOAL BulldogsKoby Stevens scores a goal from a Stoppage. GOAL BulldogsLuke Dahlhaus scores a goal from a Stoppage. Jack Macrae has turned the ball over five times, three more than any other player on the field. 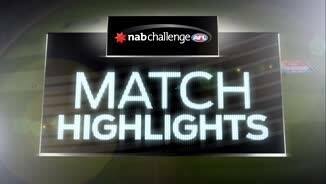 Richmond has now kicked three goals from defensive 50 intercepts. GOAL TigersChris Knights scores a goal from a Turnover. The Dogs have committed 14 turnovers. Only two have been in their defensive half. RUSHED BEHIND to Tigers from a Turnover. GOAL BulldogsTom Boyd scores a goal from a Stoppage. 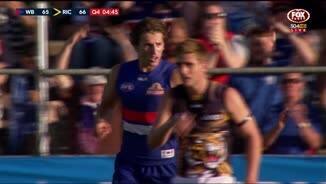 RUSHED BEHIND to Bulldogs from a Stoppage. GOAL TigersSteven Morris scores a goal from a Stoppage. Richmond has kicked two goals from turnovers. Both chains started in their defensive 50. GOAL TigersTy Vickery scores a goal from a Turnover. GOAL TigersJayden Short scores a goal from a Stoppage. GOAL TigersMatt Arnot scores a goal from a Turnover. The Western Bulldogs have won seven of the first 10 clearances, including five forward of centre, but have only scored three behinds from them. The Western Bulldogs have gone inside 50 eight times to Richmond's two. BEHIND BulldogsLin Jong scores a behind from a Stoppage. BEHIND BulldogsMarcus Bontempelli scores a behind from a Turnover. The Dogs will start with eight players on the interchange bench and the Tigers will start with seven. No substitutes are required as per the AFL heat policy. Welcome to Whitten Oval for the Western Bulldogs v Richmond Round 1 clash. TOUCHES of Hawthorn, an encouraging performance from a key forward whose name wasn't Tom Boyd and signs Marcus Bontempelli could be set for an even bigger second season were all features of Luke Beveridge's coaching debut. 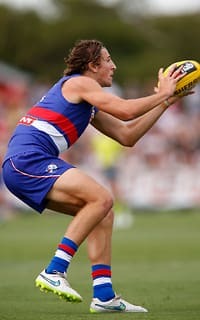 But his first win as Western Bulldogs coach was soured on Saturday at Whitten Oval with a left knee injury suffered by key midfielder Tom Liberatore. Two goals and seven marks by Jack Redpath eased the focus on boom recruit Boyd, who gathered a modest 13 possessions as a high forward, while Bontempelli had an impressive 20 touches. But Liberatore's injury midway through the opening quarter drastically diluted the Bulldogs' 0.12.17 (89) to 1.9.4 (67) win over a depleted Richmond outfit. 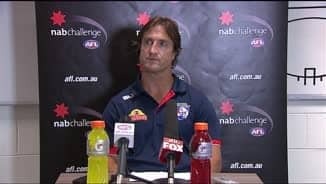 Afterwards, coach Luke Beveridge admitted it didn't look good but believed the young midfielder would bounce back if the worst was confirmed. "He's such an important person and player around the club and he's one of our new leaders so it's disappointing for him and everyone around because he's crucial to the fabric of our footy club," Beveridge said. "He'll play a role no matter what so we won't jump to the final conclusion but we'll need to move on if it is." The 2014 best and fairest winner looked to be moving into some dangerous form when his left knee buckled midway through the first quarter of the Dogs' 22-point NAB Challenge victory. The 22-year-old was chasing the ball to the boundary and planted his left foot as a tackle was laid by Tyrone Vickery. 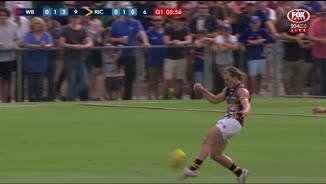 He twisted his knee as he fell and landed at the feet of Richmond coach Damien Hardwick, who was coaching from the boundary and called for the umpires to halt play. Liberatore will be sent for scans over the next few days to assess the damage. 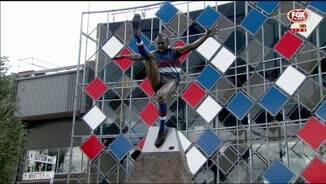 The sight of the young star hobbling off and then icing his knee was a sad one for the sell-out crowd that packed Whitten Oval for the first game at the venue since round 21, 1997. While the Dogs were nearly at full strength with Stewart Crameri the notable absentee, the Tigers were without a host of their first-choice players that included late omissions Reece Conca, Brandon Ellis, Shane Edwards and David Astbury. But they weren't disgraced and led for most of the last quarter before late goals to Jake Stringer, Bontempelli, Jack Macrae and Tory Dickson sealed the result. Hardwick said he was "pretty happy" with his young team's performance and predicted all of the senior players who missed the game would appear in their next NAB Challenge hit-out on March 14 in Albury. "Obviously we had a pretty inexperienced side out there and to see some of those players win some good contests and commit to some good bits of play - we were really pleased with what we got out of it. 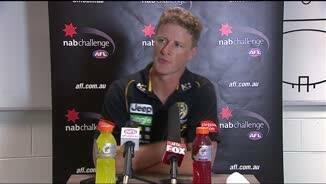 You can't buy that sort of experience for that younger squad," Hardwick said. "The majority of the players that we played today probably won't be participating early in the season so for them to get a sniff this early was really positive." Steve Morris captained in the absence of Trent Cotchin, the backline was built around Jake Batchelor and Todd Elton with most of their regular defenders out, and Ty Vickery, Liam McBean and later Reece McKenzie shared the forward line. Morris played as a lead-up forward and dragged Dale Morris down the ground many times as he ran to help out the backline. Chris Knights was a positive with the former Crow kicking two goals after two injury-hit seasons and Nick Vlastuin appears to have assumed more responsibility in the backline ahead of his third season. 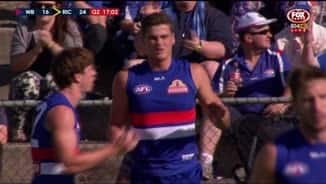 The Dogs were led for the first time by Robert Murphy, who played well across half-back before he went off at half-time, along with fellow veteran Dale Morris. Beveridge would have also been buoyed by the work of Jack Macrae, who had 25 touches, and Stringer's last quarter. Western Bulldogs: There were signs of Hawthorn about them, which isn't surprising given the influence of new coach and former Hawks assistant Beveridge. There was patient ball movement and setting up, with Liam Picken trying out a new role as a lead-up forward. Boom youngster Marcus Bontempelli is already benefiting from a strong pre-season that saw him assert himself through the midfield. It's also clear the captaincy that burdened the departed Ryan Griffen so heavily won't have a similar impact on Murphy, who collected plenty of the ball across half-back and ended with 15 possessions in a half. Western Bulldogs: All eyes were on major pick up Tom Boyd, who lined up at half-forward. He had his first touch – a handball – in the opening minute but didn't make a huge impact on the scoreboard. Played high against Elton and spent time in the ruck opposite Shaun Hampson. Former Geelong defender Joel Hamling manned Steve Morris in the backline after half-time and took a strong contested mark in the third quarter in an encouraging debut, while Josh Prudden, who was drafted in 2012, had four touches before being cleaned up in a friendly fire collision with Koby Stevens in the last term that saw him stretchered off. Richmond: Former Cat Taylor Hunt was the most prolific with 18 possessions but mature-aged midfielder Kane Lambert made sure he was noticed with seven touches in the first quarter alone. Another rookie in Jayden Short kicked a nice goal in the first quarter while defender Connor Menadue caught the eye with his incredibly slight frame as he touched the ball five times. Reece McKenzie came on in the third quarter and went to full-forward, where he lined up against Michael Talia. He missed a set shot from directly in front after Mitch Wallis was caught with the ball and didn't do much else. Daniel Butler had five possessions, Nathan Drummond nine touches off half-back and Jason Castagna 12.